NO KNITTING AFTER 11 PM. I am tempted to break that rule every night but it is never worth it. You see, knitting while drowsy can cause serious damage to knitting projects. One moment of lapsed attention can result in hours of wasted time if it is necessary to unravel a long way back to fix the mistake. That is, if the mistake is fixable. Otherwise, the item that took so long to complete will have one (or more) glaring imperfections which will keep you from ever loving your handmade creation completely. The 'no late nite knit' rule was brought in because of two particular incidents. Firstly, I had to re-knit this entire silver mitten when I dropped the very last stitch one night at around 1 am. The thing immediately laddered with remarkable speed, right down to the thumb. It dissolved in my hands like some kind of super-corrosive metal. I had to re-start the mitt and I have yet to make a match for it since the whole experience was so annoying. Later, it took me two days to fix a sleep-based error on my dad's Christmas scarf. It was the simplest type of scarf you could imagine (garter stitch) but I still made a mess of it because of the late hour. 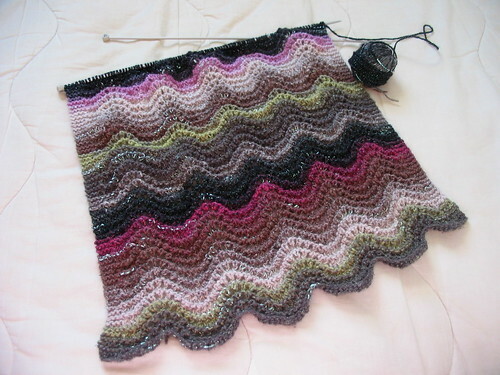 Since I was making it with vertical stripes on circular needles, I had to back-knit, like, 150 stitches. Oh, the tedium. Here's what I have put aside this evening: the Silver wrap from Naturally Noro. That photo was taken shortly before I dropped a whole bunch of stitches and mangled up the pattern. The rule did not protect me then because I was knitting during the day. The problem in this case was that I was watching television at the time. Yes, TV can affect a knitter, too. But I can't always knit while I watch TV, anyway, because the metal needles act as antennae and they mess with my reception. No joke.